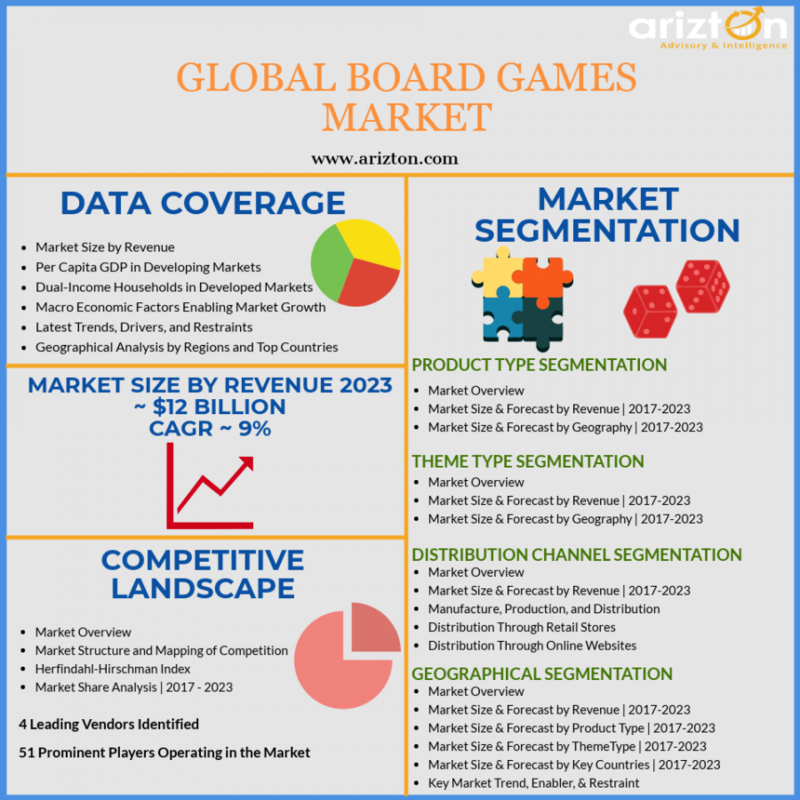 CHICAGO, IL, UNITED STATES, August 2, 2018 /EINPresswire.com/ -- Arizton’s recent market research report on the global board games market provides comprehensive industry analysis, trend forecasts, and competitive analysis. The research study segments the market by product type (tabletop games, card & dice games, collectible card games, miniature games, and RPG games), by theme type (strategy & war games, educational games, fantasy games, sport games, and others), by distribution channel (online and retail), by geography (APAC, Europe, North America, Latin America, and MEA), and offers detailed competitive analysis. The global board games market is estimated to generate revenues of more than $12 billion by 2023, growing at a CAGR of over 9% during 2017-2023. The introduction of table games that help teaching communication skills and language arts to kids and adults is augmenting the growth of the global board games market. These games are specifically designed to engender competitive recreational activities among end-users in the global market. The exponential growth of the entertainment and gaming industry is attributing to the rising demand for analog games in the market. These games are gaining immense popularity across geographies and demographics and specifically across developed economies such as the US and Western European countries. Various game designers are capitalizing on the nostalgia factor and are developing games with a modern touch to attract a maximum number of millennial consumers in the global market. The rising demand for these products and increasing end-users’ spending sentiments worldwide will contribute to the growing revenues in the global market. With the increase in the consumption of mainstream consumer leisure products is boosting the adoption of these items by end-users in Europe, North America, and APAC regions. The games are marketed and advertised as an important tool to provide hands-on and heads-on skill and knowledge development for different age groups in the global market. Additionally, well-designed games create an engaging and competitive environment in which players need to focus reinforce and apply learning. The using of these products as a visual metaphor to help connect and apply learning will transform the global board games market. Game elements, problem-solving skills, and discussions with fellow team members aid in facilitating active learning amongst end-users in the global market. Factors such as problem-solving skills and critical thinking in team-oriented games allow players to build communication and relationship skills with consumers in the market. The leading vendors are designing games as an important tool to provide hands-on and heads-on skill and knowledge development for different age groups in the market. The enhancement of problem-solving skills and critical thinking and building communication and relationship skills are propelling the growth of the global board games market over the next few years. Looking for more information? Download a sample. The integration of mobile applications with tabletop games is driving the evolution in the global board games market. These applications are not designed to detract from the physical aspect of these games, but to enhance the overall end-user’s experience. These applications are designed to remove several tedious activities involved in traditional board games such as player statistics, visual dice rolls, and rule codices and to visual maps for strategic planning to gamers in the global market. The development of digital board games is one of the most impressive revenues generators in the market. The increasing proliferation of mobile devices such as tablets and smartphones are one of the key factors impacting the growth of the global board games market. The launch of these products will help enhance the overall gaming experience at relatively low prices, thereby creating lucrative opportunities for leading vendors in the market. For instance, the mobile application version of “Settlers of Catan” is designed as 1995 port. In the application, the player can play against multiple AI or link up with online multiplayer. Such innovations might hinder the growth of traditional games in the global board games market. The increasing focus on enhancing the gaming experience of traditional games is revolutionizing the global board games market. Game publishers are investing in color, tactile, and sensory experience in the gameplay environment to meet the growing demand for 3D games in the global market. The introduction of 3D chess with multiple layers of the board at different levels, allowing the chess components to move in three physical dimensions is transforming the global gaming industry. The next area of innovation is the use of augmented reality where the physical pieces in the game are associated with animation, which represents the virtual representation of pieces and the outcome of battles between two players. The use of AR and other advanced technologies will boost revenues in the global board games market during the forecast period. For instance, HoloGrid: Monster Battle, it is an augmented reality board game and the game has put together collectible card gaming, mobile gaming, and augmented reality together. Such a focus on increasing the consumer experiences is driving the growth of the global board games market. The use of digital devices instead of boards, cards, dice, and playing tokens is expected to transform the global board games market during the forecast period. The advent of smartphones, computers, video game systems, and tablets will promote digitalization of the gaming industry in the global market. The digitization of board games can change the gameplay activities and the ways in which they are managed. The game publishers are launching a digitized version of their games to attract a larger group of consumers in the global market. Such games are designed to increase cooperation among players and strategical collecting of the victory points, thereby, enabling companies to gain a larger global boards games market share. Such developments in the overall landscape will result in profitable returns for top vendors operating in the global board games market. For more information. Read report details here. The global board games market is divided into four major segments that include by product type, theme type, distributional channels, and geography. The global board games market by product type is segment into tabletop games, card & dice games, collectible card games, miniature games, and RPG games. RPG games segment dominate a portion of the market share in 2017, growing at a CAGR of approximately 12% during the forecast period. The increasing number of loyalist gamer across demographics and geographies is propelling the growth of this segment in the global board games market. Various popular TV shows such as Freaks and Geeks, Futurama, and Big Bang Theory have popularized novelty games like Dungeons and Dragons in the global market. The time-consuming and complexity of the rules are factors that draw a maximum number of people to this types of games in the global board games market. The presence of strong and loyal customer base, increasing level of human interaction, and creativity are some of the most reason that is boosting the demand for RPG games in the global board games market over the next few years. The theme type segment in the global board games market is classified into strategy & war games, educational games, fantasy games, sports games, and others. Educational games occupied a portion of the market share in 2017, growing at a CAGR of around 11% during the forecast period. Educational games are the third most popular category and are mainly designed for preschoolers and grade-schoolers in the global board games market. These games are designed to initiate learning and are developing critical and logical thinking amongst consumers in the global market. The growing demand for these products from emerging economies of APAC as the birth rate is high in countries such as India and China will promote the growth of the global board games market. Millennials who have grown by playing these games and the increase in online buzz about game-based learning have encouraged parents to purchase educational board games for their children. Such sentiments will help boost the revenues in the global board games market. The global board games market by geography is categorized into APAC, Europe, North America, Latin America, and MEA. APAC is the fastest growing region in the global market at a CAGR of more than 13% during the forecast period. The growing popularity games across countries such as China, South Korea, and India is generating the maximum revenues in the global market. The improving the quality of life and increasing per capita disposable income in these countries is one of the major factors attributing to the growth of the APAC region in the market. The rapid urbanization among all other geographies and rising penetration of the internet is encouraging vendors to launch new product portfolios in the global market. The increasing focus on children to develop their educational and learning quotient is driving the demand for educational games in the APAC region in the global board games market. The global board games market is moderately concentrated and the top players dominate the largest share. The leading vendors are rapidly leveraging technological advancement to offer innovations and upgrades to a large number of consumers in the global market. The presence of various local and international publishers will result in intensified competition in the global market. The players are expanding their business and distribution networks across developing economies such as China and India to gain a larger global board games market share. The top manufacturers are competing on the basis of gameplay, differentiation, game genre, and platform type. The players are focusing on digitalization and developing supporting mobile applications to enhance customers’ experiences in the market. The other prominent players in the global board games market are Asmadi Games, Bezier Games, BoardGameDesign.com, Buffalo Games, Clementoni, CMON, The Walt Disney Co., Fremont Die Consumer Products, Games Workshop, Gibsons Games, Goliath, The Grey Fox Games, IELLO Games, Indie Boards and Cards, INI, International Playthings, Kamings Trade, Learning Resources, Legendary Games, Loony Labs, Ludo Fact, Melissa & Doug, Mindware.com, North Star Games, Orchard Toys, Panda GM, Paul Lamond Games, Playroom Entertainment, Pegasus Spiele, Piatnik, Pressman Toy, RoosterFin, Reaper Miniatures, Rio Grande Games, Schmidt Spiele, Spin Master, Spontaneous Games, Surprised Stare Games, SunsOut, Talicor, The Haywire Group, The Regency Chess Company, ThinkFun, TREND Enterprises, Ultra PRO International, University Games, USAopoly, Winning Moves Games, WizKids, Wonder Forge, and Zobmondo.